Well, it has been nice being back in the city and getting settled back in after a holiday. It’s been nice being back and getting into a bit of a routine once more. I’m going to try to catch up on the beers as much as I am able. Looking forward to blogging about some of the ones I had in the Maritimes, but I’ll wait til the calendar is complete for that. Today’s beer comes to us from the Colorado brewery located in Ribeirao Preto, Brazil. It is one of the oldest craft breweries in Brazil and was founded in 1995. Rather than try to copy American and European style beers they decided to use local malt, cassava flour, unrefined cane sugar, coffee and hops to create uniquely Brazilian beers. 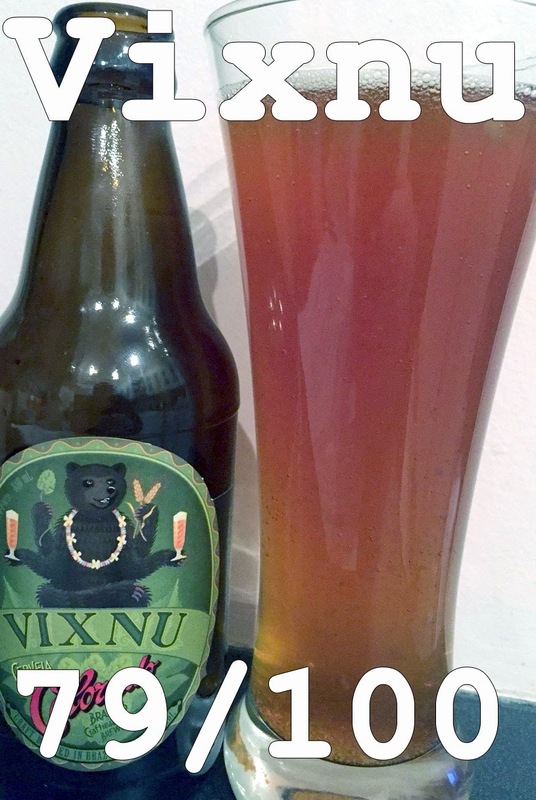 The beer in the calendar today was their Imperial double IPA called Vixnu. It is made using local malt and dry-hopped with American hops. Rapadura, a traditional Brazilian candy, is added as well to add a unique sweetness. I’m excited to give it a try, so let’s get to it! Appearance: Dark Orange Amber, slightly cloudy with quite a bit of sediment floating around inside. Good head which retains well. Smell: Very malty nose with loads of caramel and some floral and pine hop notes. Taste: Very hoppy with the cane sugar sweetness that finishes off on the tongue. Good piney hops as well as woody and resinous flavours with slightly herbal notes. Mouth feel: Good carbonation, coarse mouth feel, light body. Overall: The floaties inside were a little off putting. Made it difficult to swallow not knowing what they were. After getting past that, this is a well-balanced and nicely hoppy double IPA. It is not the best one that I have tasted in this style. Fairly average but surprisingly smooth for a 9% beer. Do I like it: I don’t dislike it. The beer is a reasonably well-balanced double IPA with good hop and nice sweetness. Sadly, the floaties were a bit off-putting and made it difficult for me to find the appeal. The flavours were reasonable and while there are other double IPAs I like a lot more, this one wasn’t bad. Getting close to the end of the Calendar. I may double up on my reviews to try and get more than one done during the day. I’m excited to get through the Calendar and given that the days have all passed, I guess there is no reason to wait. I still enjoy the excitement of finding out the new beer each day. In any case, thank you for following along and Happy New Year!